Italian poet; lived successively at Mantua and Venice at the end of the sixteenth century and at the beginning of the seventeenth. Like his father, he was a corrector in the Hebrew printing-offices at the above-named cities, which he often supplied with laudatory poems of his own composition. 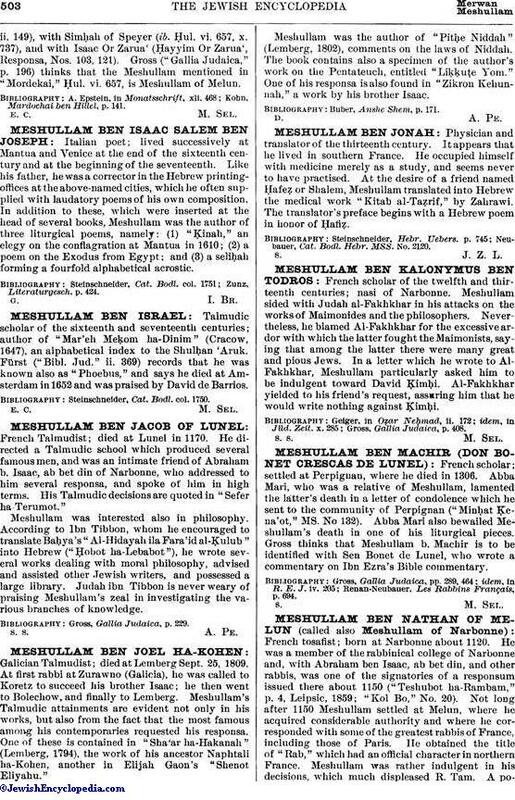 In addition to these, which were inserted at the head of several books, Meshullam was the author of three liturgical poems, namely: (1) "Ḳinah," an elegy on the conflagration at Mantua in 1610; (2) a poem on the Exodus from Egypt; and (3) a seliḥah forming a fourfold alphabetical acrostic.